Aeoniums are curious looking succulents. Their beautiful rosettes are bold and yet delicate, bolstered by strong vertical woody stems. These strange and striking plants make January’s Succulent of the Month. Distinctive features: Dark purple, almost black rosettes grow atop tall woody stems. Why I love it: This is a very striking and unique looking plant. The dark purple, almost black leaves of the rosette make a change from the lighter pastel colours typical of many succulent species. I also like the way the rosettes grow on the top of tall elegant stems – again in very different from the compact and chubby forms prized in most succulents. Although I tend to go gaga over smaller baby succulents, I have to admit this is one succulent that looks very impressive as an older and more established plant. Things to watch out for: In my personal experience this plant likes direct sunlight as long as it isn’t scorching hot, so the best bet is to keep it on a sunny windowsill until the one or two weeks a year that the UK has a heatwave, where I would then consider moving it to a more shaded spot. It will need a bit more watering in hot weather because it doesn’t like to totally dry out, but on the other hand it doesn’t like too much water as this can lead to rot so best to be quite vigilant in checking the moisture levels in the soil before rewatering. It will loose its lower leaves – they will dry up and fall off. This is normal as long as it’s not loosing all its leaves in quick succession. Once the plant is quite established, you might consider moving it to an outside position in the warmer weather, where it won’t be blasted by the elements (namely frost, rain and strong sunshine). A sheltered spot where it will benefit from the morning sunshine should do nicely. 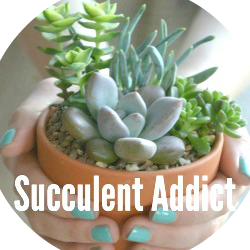 As with most succulents, keep a look out for mealy bug! If you’re impressed by Aeoniums, why not tell everyone about it?